Empire-waist dresses offer a classic look that is forever in style. Derived from Neoclassical fashions and inspired by Greco-Roman art, where women were pictured wearing loose fitting tunics belted under the bust, empire-waisted dresses are both supportive and comfortable. Channel the regal elegance of a Greek goddess at your next special occasion in a gorgeous empire-waist gown. Although empire-waist dresses can be form-fitting from neckline to hem, dresses with an empire waistlines are typically snug fitting through the bodice with the skirt falling loosely or straight to the hemline. This classic empire-waist design is still very popular and can be found on formal prom dresses, cocktail dresses, pageant gowns, as well as holiday party dresses. Empire-waist dresses often feature sweeping long skirts or layered tulle skirts and are accented with plenty of beautiful details like jewels or embroidery to portray an ultra-feminine vibe. Shop this assortment of empire-waist dresses at Simply Dresses for your next formal evening gown, party dress, or short cocktail dress with an empire waistline. Is an Empire-Waist Dress Flattering? By design, empire-waist dresses feature fitted bodices that cinch just below the bustline, providing a flattering high-waisted appearance. On both formal evening gowns and cocktail party dresses alike, the empire-waist style emphasizes the narrowest part of the body and therefore helps provide a shapely hourglass figure. Empire-waist dresses with a-line style skirts are especially favorable for pear-shaped figures, expecting mothers who want to hide a baby bump, or others who wish to camouflage the waist and hip areas. If you have a fuller body shape or want to highlight your bustline, try one of the empire-waist dresses with ruching. 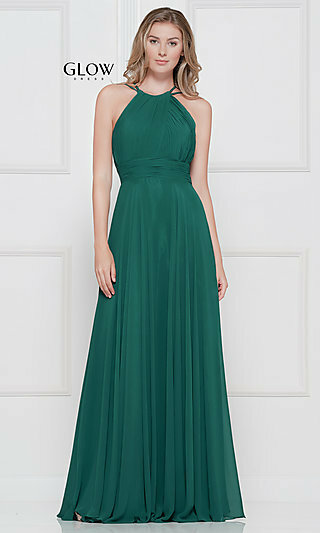 To slim down your look and minimize the bustline, simply slip into a sweetheart evening gown with an empire waistline. An empire-waist dress frames your upper body and drapes loosely over your torso and lower body, creating a truly elegant look. The raised waistline of an empire-waist dress will help draw attention upwards to your face and upper body, giving you a long, lean look. Choose an empire-waist formal dress, empire ball gown, or long evening dress with an empire waistline to showcase your shapely silhouette. Here you will also find short cocktail dresses with empire waistlines, semi-formal empire party dresses, and little black dresses with empire waists. An empire dress is one of the most popular looks in formal dresses and party wear as it is flattering for all figures and ages. From trendy styles for formals to romantic designs for weddings and cocktail parties, this collection of dresses with empire waists is sure to please.